When you commit your loved ones and yourself to a healthy lifestyle, it usually means that you have to select a variety of foods (including grains, vegetables and fruits) that are low in fat, saturated fat and cholesterol. With Bac'Uns, you are making that commitment for healthy living come true by adding a delicious meat-free alternative to bring hickory-smoked bacon flavor to your salads, soups, side dishes, omelets sandwiches, and more. 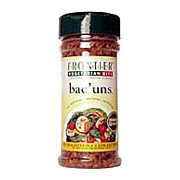 Sprinkle some or a lot of Bac'Uns on your favorite salads, casseroles, soups, or any dish you want to make it pop out in both texture and flavor. Think of it as an added bacon-flavored bonus to impress your family and friends at mealtime. Textured vegetable protein (soy flour and caramel color), soybean oil, salt and natural flavors. Bac''Uns is shipped in a discrete, unmarked package. Orders are processed immediately and usually take about 3 to 5 working days to be received. We do ask that you try it for 2 to 3 weeks to feel the full effects. Any information received is used only for order processing and shipping purposes. Your information, such as e-mail address, will never be disclosed to a third party.